Earlier this month, my daughters and I went to Toys “R” Us to download the special Shaymin distribution to our Pokémon Diamond and Pearl games. On March 8th, we’ll make the trip again to get the limited edition Regigigas. What’s so special about it? What’s most important is what it will do when you transfer it to Pokémon Platinum, due out in the U.S. on March 22nd. 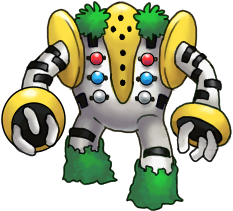 If you have this Regigigas in your party at certain times, you may be able to find and capture the 3 Legendary Pokémon of the Regi Trio: Regirock, Regice, Registeel.